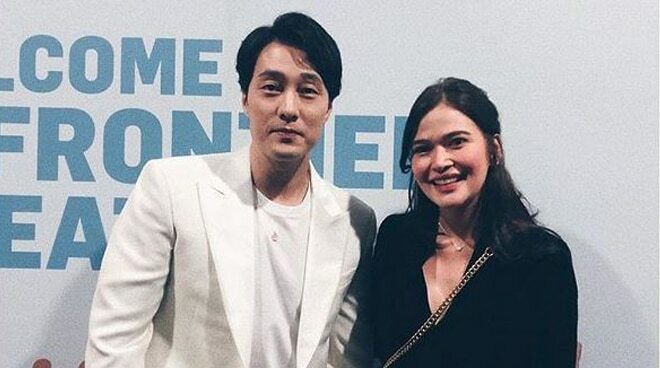 Bela Padilla, a superfan of Korean actor So Ji-sub, didn't waste any time when the opportunity to have a meet-and-greet with the latter came knocking at her door. Just like any other fangirl, she did what she had to do: have herself excused from the set of an upcoming project with JC Santos and filmmaker Irene Villanueva. "So I just met So Ji-sub. And I need to say thank Direk Irene for allowing me to leave set really quickly. Thank you so much. And JC Santos for understanding my fangirl needs," she said in one of the videos posted on her IG stories. Sharing her lucky encounter with the Korean actor, Padilla wrote in the caption: "One second that changed my life. Welcome to Manila, Oppa!" So Ji-sub, popular among K-Drama fans, has starred in a number of successful TV series, including I'm Sorry I Love You, Cain and Abel, Phantom, Master's Sun, and Oh My Venus. So Ji-sub, who met his supporters at the New Frontier Theatre last Saturday, March 16, held a fan meet in Manila as part of the Asian leg of his Hello Tour.